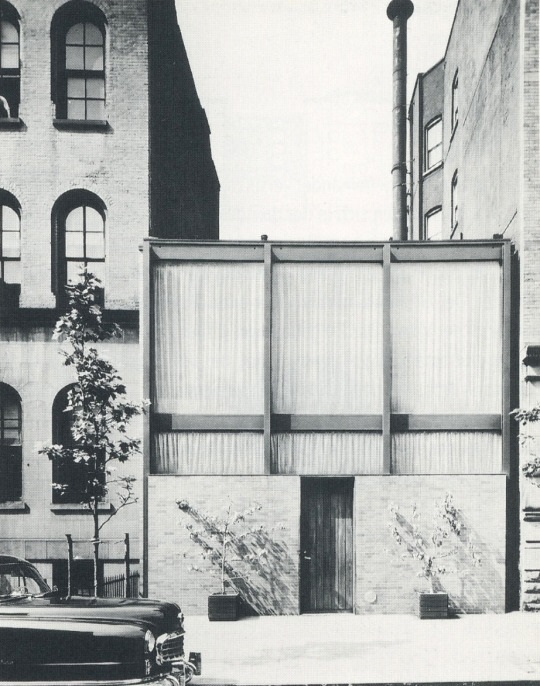 In 1950, Philip Johnson completed a townhome in Midtown Manhattan for the Rockefellers. The simple mid-century modernist gem has become an icon of the halcyon era, with a black steel frame filled with a blind brick first floor and large floor-to-ceiling plate glass windows above, and an open floor plan hiding an exterior courtyard and reflecting pond, with a bedroom suite beyond. Like most things I enjoy, I’ve re-drawn the project, but on a strict nine-square module and outfitted with a more traditional aesthetic. The brick, not the steel frame, becomes the driving tectonic, with columns in place of sliding plate doors at the courtyard, which itself is centered on a fountain rather than floating around one. The rear bedroom suite is more glorified with a full gable where the hip roof of the main house is tucked behind shallow brick parapets. The front elevation remains rather blind, but trades a single french balcony window for the trio of floor-to-ceiling glass panels. The plan above is a direct take on Philip Johnson’s Hodgson House of 1951, at New Canaan, CT. The original is of the same mid-century modernist vein as his own storied Glass House of 1949, also in New Canaan. My version keeps the same U-shaped floor plan, but filled out to take up an entire square, and replaces the focal fireplace wall with a half-round bay. Most dramatically, though, the entire exterior is rendered in brick, including the window openings, which in Johnson’s were a black steel and glass system, no doubt in deep homage to Mies’ contemporary work at IIT, Chicago. A shallow shingled roof completes the traditional restylization, and makes the whole more reminiscent of the earlier Chicago traditions of Richardson & Burnham. Having begun my architectural education in Southern California, Mid-Century Modernism (and especially Richard Neutra*) has always held a place of honor in my personal canon – MadMen be damned. Among the Eastern variants of that style, the Harvard Five are most likely the most influential. Today’s work is a variation on Eliot Noyes’ own home at New Canaan, CT. Effectively, I’ve taken the iconic low-slung, masonry-clad, flat-roofed house and swapped its stylistic elements for more traditional, vernacular ones: an arched entry opens to a colonnaded patio; hip roofs with exposed trusswork sit over the living rooms and bedrooms; and double glass doors replace the sliding panels that so often fail. A brick variation is below, with jack arches in place of the wood trabeation found above. *Growing up around his buildings at the Crystal Cathedral didn’t hurt either. . .
Take last week’s modern courtyard, put it on a diagonal axis, and wrap the corner ‘L’ volume in a reduced vernacular language and this is what you get. My brother is kind of infatuated with mid-century modernism, with volumes on Palm Springs and Neutra strewn about his house. So naturally, I began to tinker with what I might do with the tropes of ‘MCM’, and how I might incorporate it into my own tendencies of modular, square plans. This plan again plays on ideas of four and nine-squares, with brick walls surrounding three sides of a square, one half of which is dedicated to the interior domestic spaces and the other is given over to the exterior with a brick patio, wood deck, gravel garden, and a pool. The timber-framed living volume is flanked by a service bar in which a small entry courtyard is situated. I’m not happy with the pool, and am tempted to try it on center rather than the side. . .
We all know what gas stations look like here in America – banal. Yet, the same ‘Mid-Century’ Modernism that is so popular right now also tidied up these rather pedestrian buildings as well. Mies van der Rohe even tried his hand at one in Montreal as part of a larger development. However, decades of neglect and changing cultural tastes have obscured the once minimal elegance of these structures. I drove past an example in Santa Monica that had been covered up in all the various and cheap appliques of ‘Mediterranean’ style. If Modernism could love this typology, could good Classicism? Behold, the fruits of such thinking – Doric porticos and pyramidal skylights. enter your email address to follow 'frame' and receive notifications of new posts by email. frame and all content are copyright © Nicholas S. Coleman, 2016-18.